This work is part of a series exploring of the structure of the alternating group on five elements, also known as the icosahedral group. 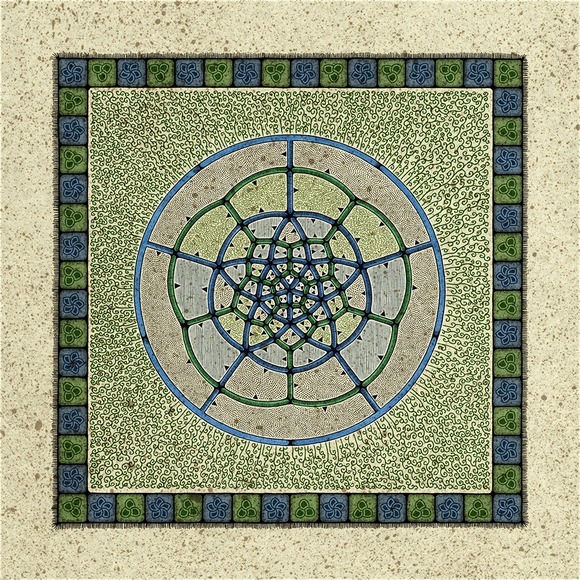 This image is based on a presentation of A5 given by two generators of orders 3 and 5, shown in green and blue, respectively. The elements of the group are associated with the faces of one of the Catalan Solids, the deltoid hexacontahedron, shown here projected into two dimensions. The edges of this polyhedron form the dual graph to the Cayley diagram for this presentation of the group, and indicate the relationship between the generators and the group elements. The faces of the polyhedron (i.e. elements of A5) are given different textures corresponding to their conjugacy classes. The image is constructed from multiple hand-drawn elements and natural textures which are scanned and digitally manipulated to form a composite image and subsequently output as an archival digital print.